Jimmy Carter has been teaching Sunday school ever since he was a young midshipman in Annapolis; in later years he conducted religious services on submarines on which he served, and even led the occasional class in Washington while he was president. For the last 25 years, President Carter has taught the adult Bible study at his church in Plains, where several hundred visitors join him each Sunday to understand the wisdom of the Bible and apply it to their lives. 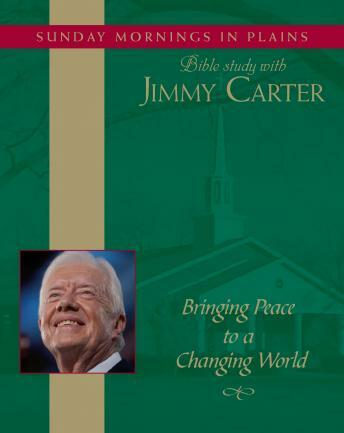 Bringing Peace to a Changing World presents four classes President Carter taught on the Book of Isaiah in December 2001. Exploring the historical and contemporary resonances of Isaiah's prophecies, culminating in his vision of a leader known as 'Wonderful Counsellor, Mighty God, Everlasting Father, Prince of Peace' (Isaiah 9:6), President Carter addresses such vital issues as faith, free will, and the importance of honoring the values we celebrate even as the world changes around us. Recorded at a time of national grief and healing, when the world was torn by conflict and fear, these classes include President Carter's reflections on his personal experience waging peace in the Middle East and elsewhere, and conclude with practical, inspiring examples of how each of us can answer the call to demonstrate peace on earth and put these prophesized ideals into practice in our lives and communities.